These catch cans are used to keep oil from entering the intake tract to help keep your vehicle running at its best. 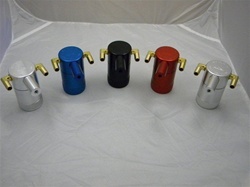 Designed to provide the best flow and filtration, these catch cans feature a divided and baffled top with an oil separation element on each side. For ease of emptying, each catch can features a knurled bottom or a drain valve.